We’re thrilled that thousands of you have downloaded this wonderful little piece (just 24.3MB) of free technology. If you aren’t part of that growing mobile community, you are missing out on a one-stop-shop for all of the museum’s mobile platforms. On your phone now? Tap here to download. Or jump to detailed downloading instructions. 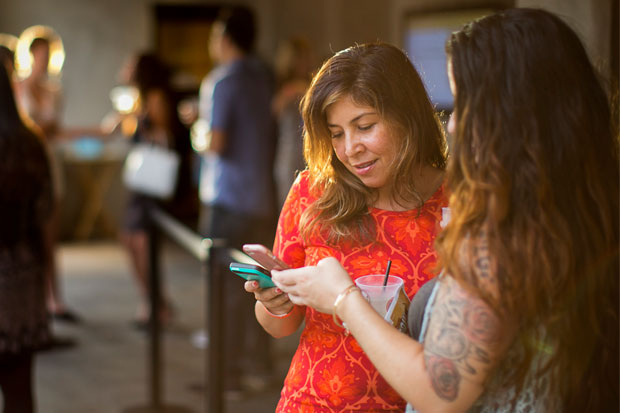 Your account and member card: If you are a museum member, there’s a special tab in the “My account” area of the app where you’ll find a digital member card that’s unique to you—it gets you your theater discounts and into events like ARTafterDARK in seconds. Not a member? The “My account” area also functions as an archive of your past purchases and personal museum interests. Buy tickets on the go: Maybe you heard about a concert, but haven’t had time to sit down and reserve a ticket online. The “Events” area presents a streamlined, mobile-friendly purchase path to book your seats in record time. The app stores all of your upcoming theater tickets in the “My Account “area, under “My Tickets.” Pull them up when you get to the box office to get scanned in fast and paper-free. Not sure how to get to the theater? Google Maps is embedded in the transaction area, too. Blog, videos + social media: Want to know what’s happening at HoMA? You can find full blog stories, recent YouTube videos, and all of our social media platforms all conveniently accessible within the app’s menu. Desktop version in reach: If any part of the mobile experience makes you homesick for the museum’s main desktop site, you can easily jump back and forth between both versions through navigation links. • Contests, quizzes, and other opportunities to win museum discounts. I want the app! Where can I find it? If you are on your mobile device now, just tap here to download. Otherwise, you can search “Honolulu Museum of Art” in the Apple App Store or Google Play to find and download our new app. It requires iPhone iOS 7.0 or higher, or Android 4.0 or higher, and at least 25MB of space. How do I navigate once inside the app? The first thing you will see in the app is a welcome screen that is part of a slideshow featuring a few of the museum’s current exhibitions (each with a button linking to their own pages). In the top left corner of the app there is a three-bar icon—tap it at any time to see the full menu. I got the app, now how do I log in? • Go to the “My account” area. • If you recently (since April 2016) created a new login on our desktop site, use those credentials to log in. • If you are a member, but don’t think you have updated your account since April 2016, tap “Forgot login?” and enter the email associated with your membership (not sure what that is? Call member services 808-532-8724, Monday through Friday, 10am to 4:30pm). •Totally new to all of this? Tap “Register” to create an account. Note: Several of these options may require you to retrieve information from your email. Why wouldn’t the scanner detect my member card at check-in? Our scanners are afraid of the dark—so make sure your screen brightness is up! Please post them in the comments section below! I downloaded your mobile app and tried to register, but because I am a member it requests my password, which I don’t have or have forgotten. How do I retrieve my password or re-set it? Thanks for your question. Within the app, go to “My account” in the menu, then tap “Forgot login?” to begin the password reset process. You can also do this on a desktop browser, by clicking here. If you need further assistance, call member services at 808-532-8724, Monday through Friday, 10am to 4:30pm.